Catherine II, the most famous of the women who ruled Russia. 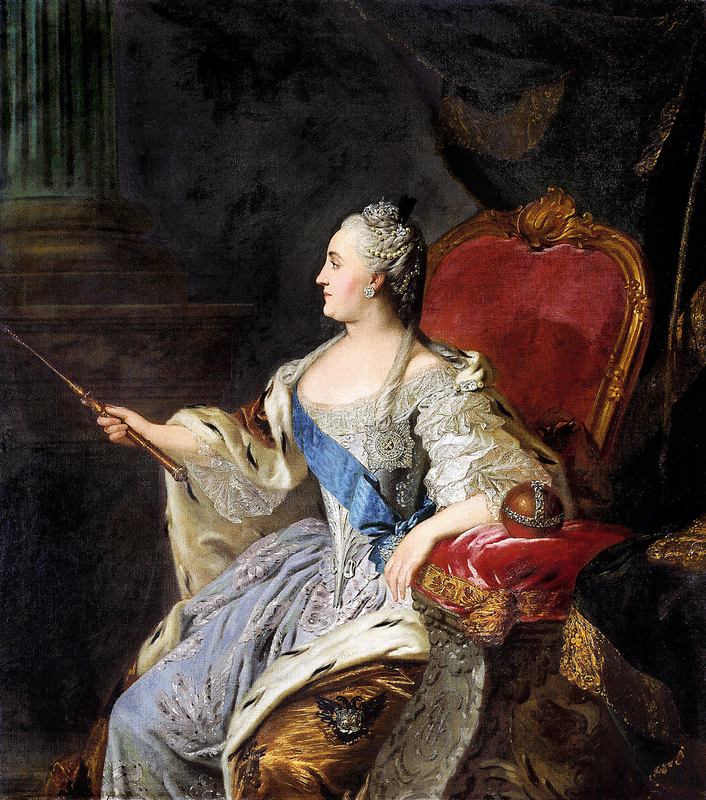 Catherine II, the most famous of the women who ruled Russia, died 220 years ago on Nov.17. Best known for her conquests, her favorites and her love of the Enlightenment, this former German princess shares a moniker with only one other Russian ruler. Find out why that is. Sophie Friederike Auguste von Anhalt-Zerbst-Dornburg was born on May 2, 1729 in Stettin, Prussia, which is today Szczecin, Poland. Her father was a minor German prince, but he had married well, and his wife’s bloodlines opened numerous prospects for his daughter. She charmed Russia’s Empress Elizabeth, who was in search of a bride for her nephew and heir, the future Peter III. The young princess took the name Ekaterina (Catherine) when she was baptized into the Orthodox faith in order to marry Peter. Modest and charming, young Catherine was popular with the noble elites — but Peter himself was not. He reigned only six months, from January-July 1762, before abdicating in favor of Catherine. Only a week after abdicating, he was killed. Although there is no proof that Catherine knew of the murder, she has long been rumored to have ordered it. Describing the empress, historian Alexander Orlov wrote: "All her life, she was burning with ambition, and, having reached power, she tried to keep it by all means.” Once on the throne, the Empress quickly concentrated all power in her hands: she reformed the Senate, reducing its lawmaking power, and took away land and peasants from the church, depriving it of its economic base. However, like other European sovereigns of the 18th century, she was committed to the concept of enlightened absolutism — in which the monarch rules single-handedly, but for the sake of the people and for their own good. One of Catherine's large-scale projects taken on “for the good of the people” was the convening of the Legislative Commission in 1767. This temporary legislative body was supposed to develop a new comprehensive law that would reconcile the interests of all classes. Even the abolition of serfdom was discussed. In the end, however, the commission had to be disbanded due to fears that disgruntled nobles might revolt against the empress, according to Orlov. The rule of Catherine can justifiably be called the golden age of the Russian nobility. Noblemen were exempt from military service and paying taxes, and they were granted the right to open their own factories and to trade. They made up the country’s military and political elite, and were known as much for their extravagant parties as for their excellent education. Peasants, on the other hand, had little to thank Catherine for. During her reign, they lost the little freedom they had — they were forbidden to complain about their landlords, and the landlords were given the right to force peasants to do hard labor. Peasant revolts, the best known of which was Pugachev’s Rebellon, broke out across Russia in the 1770s. They were all suppressed. Catherine successfully waged wars abroad as well as at home. One of her major goals was to increase Russian influence in Europe. She incorporated Crimea, seizing it from Turkey, and, with the leaders of Austria and Prussia, partitioned Poland out of existence, incorporating into Russia the territory that today makes up Ukraine, Belarus, Lithuania and Latvia. Catherine primarily owed her military victories to her brilliant generals. Alexander Suvorov was one of the best generals in Russian history, and Grigory Potemkin, one of the empress’s favorites, reformed the army along European lines. Catherine prioritized the arts and sciences as well as the military. She put together the collection of paintings, drawings and sculpture that formed the beginning of the Hermitage, now one of the largest museums in the world. She also invited to St. Petersburg a number of important European architects who created the famous palaces and churches of Russia’s northern capital. During her rule, a system of schools was created, and the Smolny Institute, Russia's first place of higher learning for women was opened. The empress herself published the satirical magazine Vsyakaya Vsyachina ("Odds and Ends") made up of her own writings and also wrote morality plays. She was a regular correspondent of the Enlightenment philosophes Voltaire and Diderot. "It was he, or rather his writings, that shaped my mind and my beliefs," Catherine wrote of Voltaire. The philosopher, in turn, spoke of Catherine with great respect and promoted the empress in Europe. Even though legends about the empress's sexual appetite persist, all that can be said with any fact is that she had a number of favorites, many of whom doubled as lovers. Historian Peter Bartenev cites a figure of 23 such favorites. These men had great influence at the court, received expensive gifts, palaces and land, and were appointed to high positions — not always deservedly. Her last favorite was 22 at the start of their relationship, while Catherine herself was 60. Their association ended only with Catherine’s death in 1796 at the age of 67.